Learn how to get started with NH OverDrive. Using RPL’s OverDrive account with the NH State Library's Downloadable Book Consortium, you have access to thousands of ebooks and audiobooks right from home! Renewing your book is easy and returns are automatic! You can read eBooks on just about any device – computers, Kindles, tablets, even on your phone! And Audiobooks are a fantastic way to spend a long commute, to make a story come alive, and to engage young readers. 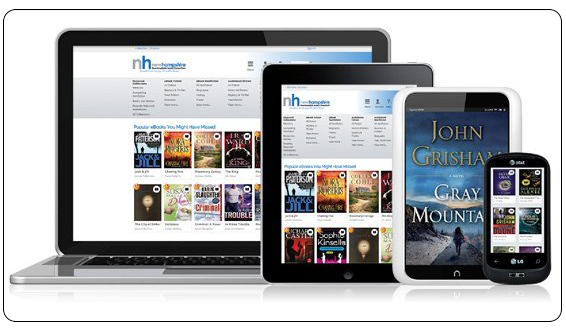 Using RPL’s OverDrive subscription with the NH State Library's Downloadable Book Consortium, you have access to thousands of ebooks and audiobooks right from home. Renewing your book is easy and returns are automatic! We’ve put together some information and links to help you get started with OverDrive. As always, if you have any questions, you can come down to the library or contact us. Getting started can seem daunting, so we’re happy to help as you learn how to use this excellent service! Overdrive gives you access to thousands of ebooks and audiobooks right from home! You sign in to OverDrive using your RPL library card – Starting on the NH OverDrive homepage, simply click the Sign In button located at the top right corner of the page. Select the Rollinsford Public Library from the dropdown list. TIME SAVING TIP: If you’re on a personal device, select "Remember my card number on this device" so you don't have to pull out your library card next time! The New Hampshire Downloadable Books Service maintains a blog specifically dedicated to helping people with OverDrive. They have a Device Guide that gives you tips on using OverDrive with your specific reading device (Kindle, Nook, iPad, etc) and there are pages for both Audiobook and eBook help. You can also browse How-to and Troubleshooting articles. P.S. There’s an app for that! Libby is an app made especially for libraries by OverDrive. You can use this app to manage your ebook loans, browse OverDrive, download and stream audiobooks, and more. Helps you download books and audiobooks for offline reading, or stream them to save space on your device. Libby can send your library books right to your Kindle (if you have one). Keeps track of your reading history in the Activity tab. Positions, bookmarks, and notes are kept in sync across all devices. Get a sneak peek of the app in this quick video! Contact us or come on down to the library!